The coffee and bagels were great, but it was more than a free breakfast that convinced folks to battle the traffic into downtown DC for the Google Federal User Group meeting. A few hundred government employees and engineers from the aerospace industry gathered in Washington DC to experience firsthand how ESRI's GIS product offering and Google's Earth and Maps enterprise products can powerfully co-exist and inter-operate to deliver an exciting and intuitive user experience. Michael Bradshaw, Google's Head of Federal and Jeff Peters, ESRI's Federal Director, kicked off the event and set the stage for a number of live demonstrations. First, members of ESRI's technical marketing team walked the audience through a short series of presentations that highlighted ArcGIS Desktop, ArcGIS Server, and data from ESRI's Business Analyst with interactive results seamlessly presented within Google Earth and on Google Maps. The demos showed how someone unfamiliar to DC could find an apartment using Google Earth, ArcGIS server and external web content sources such as Craigslist. The demo also showed how one could edit vector data in ArcGIS by moving and adding nodes within a dataset and then via a network linked KML that referenced an instance of ArcGIS Server, changes in the data were promptly reflected on Google Earth globe. 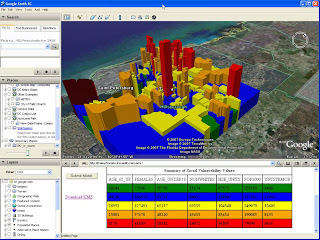 Additional demonstrations showed models combining ArcGIS and Google Earth data on issues such as international health and the socioeconomic risks intrinsic in natural disasters. Google engineers then demoed the new releases of Google Earth Fusion 3.0 and Google Earth Enterprise Client (EC) 4.0. We've previously shared some of our customers’ reactions to the launch of these new Google Earth Enterprise products and posted them on this blog and we also shared some of the specific details of these new products themselves on Google's official Lat Long Blog. We look forward to continuing to work with ESRI and our customers to leverage the power of geospatial information. If you would like to learn more about our products and how we compliment an ESRI enterprise or want information on how to register for the next Federal User Group meeting or in, contact us here. Matt Glotzbach, Enterprise Product Management Director, announced this morning during his keynote the launch of IMAP support for Gmail, the newest Google Apps release since the suite of communication and collaboration tools debuted in February of this year. That's right -- you can now sync actions taken in your Gmail account across all of your devices, instantly and automatically. Matt's keynote also dealt with innovation best practices and included some startling facts (for example, approximately 2.4 billion people -- 1/3 of the world's population --carry a cell phone; every minute, there are 7 hours of video uploaded to YouTube). He explained that there are multiple ways that companies can innovate successfully, all of them important and none of them mutually exclusive: product, process, service and business model innovation. Matt also talked about the importance of building products with the aim of meeting user needs and placing an emphasis on iteration and rapid change. 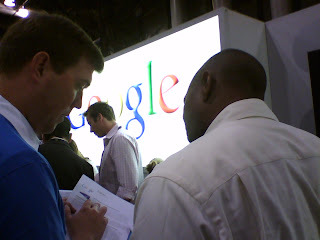 If you're in town, stop by the Google booth (#861-863) for a product demo or to chat with someone about Google Apps, the Google Search Appliance, AdWords or whatever else is on your mind. IT at Google - It's all about "choice over control"
Working at Google has its perks - great food, amazing people, the shuttle to and from work. But one of the best "perks" of working at Google is being in an environment that is designed to bring out the best in all of us. Every aspect of Google is tailored to the individual and the team, and making those teams more productive, fostering creativity, and designing solutions to really big problems that can have game-changing effects. I also count myself lucky to spend some time now and then with Douglas Merrill, VP of Engineering and our CIO here at Google. I've learned a lot from him in our conversations, and now he's shared some of his thoughts on the role of IT and the future it will play in companies in the latest issue of CIO magazine. I found it an insightful read, and highly recommend it to anyone who has a technology role in business. We're pleased to announce that we're awarding the Google Enterprise Superstar award to three businesses that have implemented the Google Mini to power search on their public websites. Steve Suhocki of the GAIN Capital Group chose the Google Mini to power search on www.forex.com , their online foreign exchange trading platform. Read the Forex.com story. Kris Arnold implemented site search with a Google Mini on NUVO.net, Indianapolis' popular weekly publication for real news in local, politics, culture and art. Kris' likes using KeyMatches to pair popular searches with the content users will probably be most interested in. Read the NUVO.net story. And last but not least, we're awarding the Google Enterprise Superstar award to MotorcyleUSA for implementing site search with a Google Mini on MotorcycleUSA.com, and for using a Google Search Appliance on their ecommerce store front at Motorcycle-Superstore.com . Read the MotorcycleUSA story. Congratulations to our latest award winners! Today we announced the release of Google Search Appliance version 5.0. We're not often big on version numbers, but for us and our customers who need to find information throughout their enterprise, that "5.0" means something. Among other things, it represents five years of experience tackling the challenges of search for businesses. With the Google Search Appliance we've taken much of what we've learned about serving results efficiently and at scale to millions of users worldwide and brought it to the enterprise. And we went further. We added enterprise-grade security to ensure users only see the content to which they have access. We also gave more control over system set-up and administration without sacrificing the relevance and ease of use you expect from Google. Along with more control, we extended the reach even deeper into the enterprise. Users will now be able to search for data residing across the numerous siloed content repositories that have become commonplace in large businesses, including EMC Documentum, IBM FileNet, OpenText Livelink, and Microsoft Sharepoint, through the same easy to use interface, in the same intuitive way. Version 5.0 also represents a wealth of innovation potential. So we've also launched Google Enterprise Labs as a way to share some of what we're continuing to explore. With Do-it-Yourself KeyMatch, for example, users can promote results they feel should appear at the top of the page. We recognize that institutional knowledge not only resides in documents, but in people. We use Do-it-Yourself KeyMatch inside Google -- an experiment that's both social and technical. And the results, so to speak, have been great. Finally, 5.0 represents what we hope for the future in enterprise search, which means both more (in terms of reach and relevance) and less (in terms cost, administrative overhead and wasted time). It's a perfect balance we will continue to pursue.